In the thread charts that follow the correct tapping size is given in the information. We also give the alternative maximum size, as with good modern drills the drilled hole can be small. On tough materials like stainless steel we recommend you take advantage of the extra allowance. It is especially important in deep holes of 2 times diameters and greater. First class tapping can only be done with a copious supply of proper lubricant. Use of the correct lubricants is as important as the decision to use it, it must be kept clean and carefully directed into the hole being tapped, an ample supply is needed on the cutting edges, not only to disperse heat, but to aid in the formation & removal of chips. 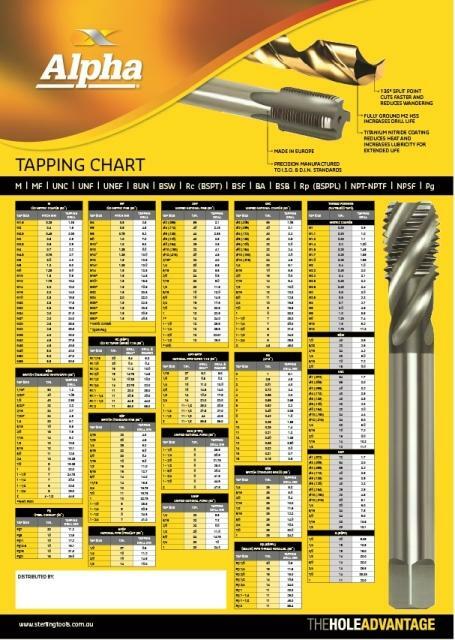 Efficient tapping has its optimum speed, see the chart below for an initial recommendation & guide. Exact figures cannot be given because of the variables such as machinability of the material being tapped, condition of the machine, depth, pitch and length of the thread, holding fixture or tapping attachment. From practical application adjust our recommendations up or down until optimum results are obtained. When starting a tap do not force or retard the tap, or a bell mouthed hole will be produced with thin threads. Allow the tap to establish its own pitch. During tapping of a deep hole, avoid the flutes becoming clogged with chips. Breakage is inevitable in these circumstances, consider a fluteless tap for very deep holes. Chip disposal is a large problem on taps of 12mm and smaller where the flute space is restricted - see description on spiral point and spiral flute taps below. For hand tapping, the conventional set of 3 taps with straight flutes is recommended. It is essential that the tap is presented squarely to the work and that the taps are correctly aligned. When taps are used in a machine it is usual to use only the second lead. Using the bottom tap only, can cause problems and will significantly reduce the life of the tool. These are also hand taps. The roughing tap takes out half the thread area it is marked with a ring on the shank for identification. The Mid-Rougher will take out to 75% of the area of the thread, it is marked with 2 rings on the shank. Only the plain shanked Finish tap cuts SIZE. These taps are sometimes called GUN-Nosed, are made with a special leading flute ground at an angle to the tap axis. This left hand flute at the lead pushes the swarf ahead of the tap threads thus allowing the use of smaller flutes since chip clearance is not required. The result is therefore stronger taps which are suitable for through hole tapping in most materials. Blind hole tapping should only be attempted where there is sufficient room at the bottom of the hole to accommodate the swarf. These taps have a continuous spiral flute the same hand as the thread, thus forcing the swarf up the hole. The most suitable applications are on blind holes in ductile materials with long continuous chips. Slower 15° spiral may be used on tougher materials. 1. G series threads (BSPF) - this is a parallel fastening thread for BS2779 where pressure tight joints are not required. 2. 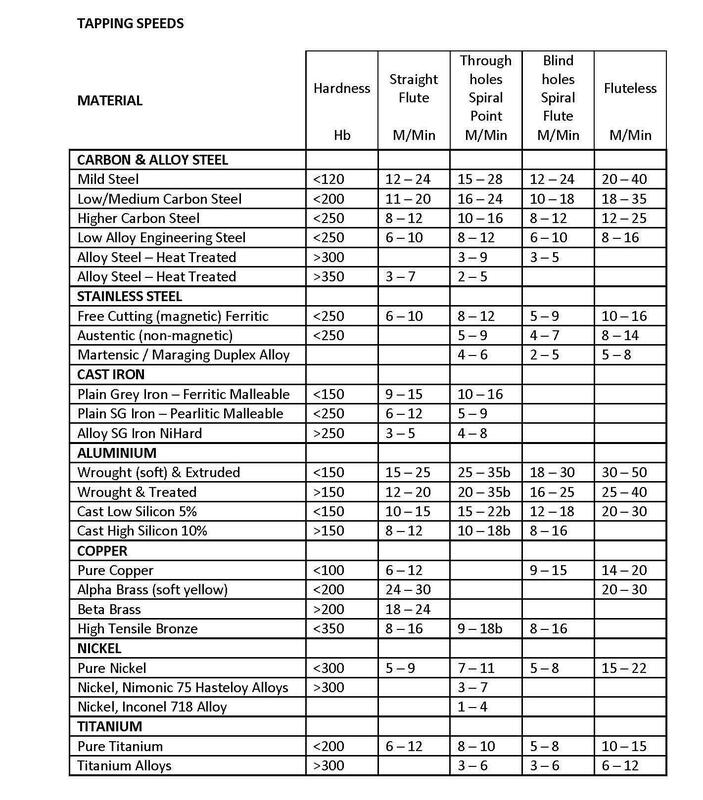 Rc series (BSPT) threads where pressure tight joints are required. These taps are made to BS949 with ISO shanks and squares. Taper reamers are an advantage on tapping these threads and 1:16 taper reamers are often used for this application. Interrupted thread taps are also available for stainless & other work hardening materials. 3. Rp or BSPPI are undersize Parallel taps for use on BS21 gas tight applications. They have tapered plugs assembled into the parallel hole and are destructively dry sealing. NPS taps can be used for NPSC & NPSM parallel threads. NPSC threads are internal couplings and may be used with sealant for low pressure pipe work. NPSM is used as a mechanical fastening thread. NPSF are parallel undersize threads with truncated crests for dryseal use with tapered fitting. NPT are standard taper taps and can be assembled with jointing for low pressure work. Tapered pipe reamers can be used to aid tapping, and interrupted thread taps for stainless & other work hardening materials. NPTF are similar to above but with truncated crests to effect a dryseal. We recommend the use of a tapered reamer when tapping this thread. FLUTELESS ROLL (Cold Forming) TAPS Fluteless or cold forming taps can be used in a wide variety of materials from steel, aluminium, copper and soft ductile brasses but will also cut stainless and titanium and nickel materials. As these materials may tear rather than cut cleanly, they tend to clog the flutes of conventional taps. The fluteless tap offers an alternative forming by displacing the material instead of cutting. It should be noted that the biggest change is the requirement of a larger tapping drill The fluteless tap also can tap faster than a standard tap Lubrication is of the utmost importance in thread forming, with an extreme pressure additive is advisable in soluble oils. 1. Tap out of alignment with the hole or tap not running true. 4. Incorrect tap for the material, e.g. (a) cutting rake too great, (b) Incorrect thread relief, (c) Chamfer lead too short. 5. Incorrect sharpening e.g. chamfer relief uneven or too excessive. 8. Lubrication lacking or wrong quality or specification. 9. Material too hard, or abrasive for the tap type. 11. Tap has reached the extent of its life. Consider type of tap used, or items 3, 4, and 8. 12. Tap blocked with swarf - is it the correct type of tap? (see items 1, 3, 4c, 5, 6, 7, 8, 9, 10, and 11).